Can you believe it's Thanksgiving TOMORROW? I mean,I'm pretty darn excited, Thanksgiving is super special to me. I've always loved it. We used to go to my Gramma's for dinner every Thanksgiving, and I absolutely loved the feeling of coziness and togetherness that I always felt during my time spent at her house. It was always a big deal for everyone to sit and eat dinner at the same time. Before smart phones and devices, back when you actually had to have a conversation with people and couldn't sit scrolling mindlessly through your phones. It wasn't until I spent my first Thanksgiving with Nick's family that I realized people do things differently. I was surprised to learn that not every family sits down to eat at the same time, these days it's a lot busier and people sort of just grab and go. It's always been super important for me to keep our family tradition of eating at the table and all at once alive. My sweet Grandmother is getting older, and can't deal with all the Thanksgiving fuss anymore, so it was my pleasure to take over the task for her. We started hosting Thanksgiving 4 years ago and it means more and more to me as the years go on. My Gramma comes over early to help start cooking and my Mom prepares everything a few days in advance, I do help with the cooking, but the tablescape and set up has always been my "thing". I'm definitely not the best at Tablescapes, I won't lie to you. But I'm learning. 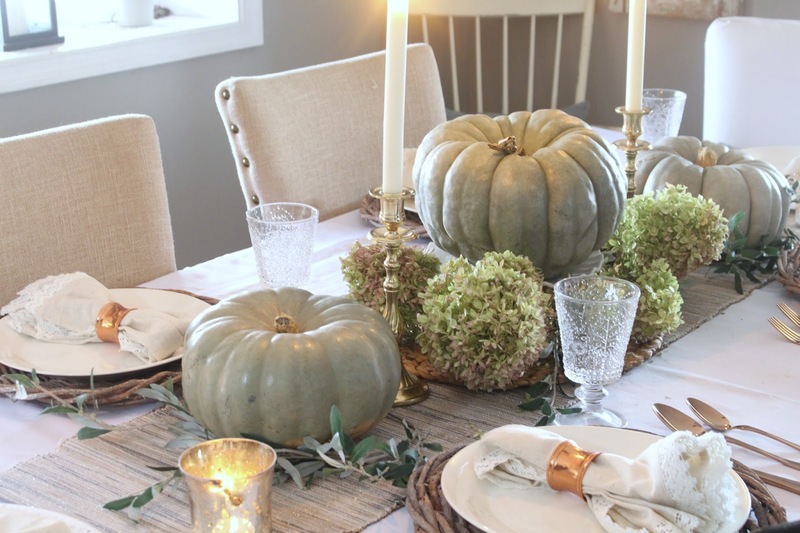 Today, I wanted to share with you a few of my best Tips for hosting Thanksgiving! I am absolutely NOT an expert at this whole thing- but that won't stop me from sharing what I've learned over the past few years with all of you! Figure out what you'll need to buy, besides food. How many guests are you serving? How many plates will you need? Cups? Silverware? This is when I also like to sort through my dishes, and make sure I have enough wine glasses and serveware. Be sure to take note of how many pans you'll need and for what. Are they big enough? Do you have the proper serveware? I inherited some gorgeous crystal, but you can often find great serveware at Home Goods for a good price. You'll also need to take note of oven space, what you'll cook and in what order. A turkey is big and often takes up lots of room and has to cook for a long amount of time. Be sure to account for that. I was surprised just how long it took to make the first time I made one! I like to do a mock up a week or so before, it gives me a visual and I take note of what I still need to buy. Sometimes I don't buy anything and I just shop the house. Last year, I created a tablescape using things I had, and with a few items I picked up from the dollar store! YES. THE DOLLAR STORE. 4. Set the tone- Sit down, and enjoy the moment! 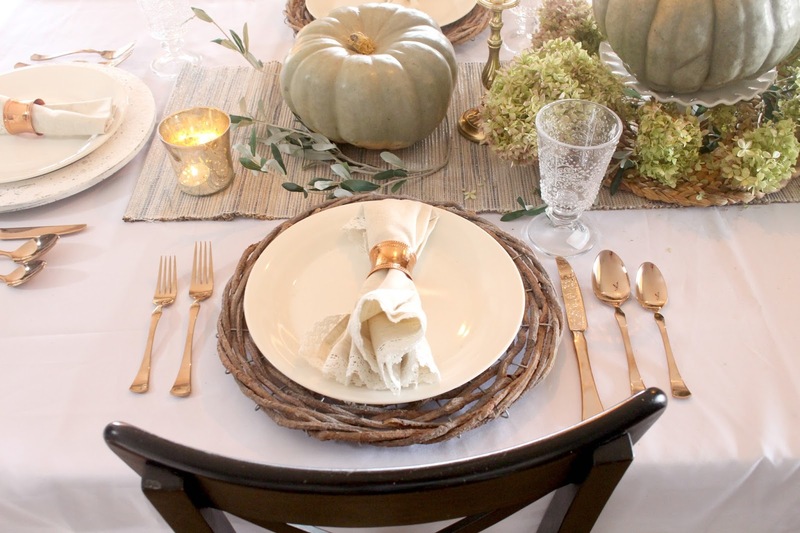 I love to put on a soft Thanksgiving playlist to enjoy while we prepare our dinner and when we sit down to eat. It really sets the tone and relaxes me. It also reminds me to be in the moment and enjoy my company. Thanksgiving is the one day where we have to remind ourselves to slow down and enjoy our loved ones, and I mean REALLY enjoy them. Every year before we sit down to say grace I feel an overwhelming sense of gratitude. My Grandmother always gets emotional. And then the rest of the family does too. What a beautiful thing it is to remind ourselves to be Thankful, yes of course we need to remind ourselves of this every single day, but the truth is, sometimes we just get so darn busy and well, life gets in the way. I love Thanksgiving because that's what it's all about. Family, Friends..and well, sometimes a really good turkey and glass of wine. I won't be blogging tomorrow because I really want to encourage everyone to disconnect as much as possible and really enjoy your loved ones. It's such a special time, and I know I really need to learn to truly BE in the moment. I truly hope you enjoy your Thanksgiving my sweet friends! Are you hosting? I'd love to hear some advice and tips if you do! I'm always keeping my eyes and ears open! I love to chat with you! Feel free to message me on Instagram, or Facebook. You can also leave a comment below, because well, I just love hearing from you! Have a great thanksgiving!!! Enjoy every last drop!! 100,000 Followers on Instagram? THANK YOU! Where To Buy Chalk Paint!